Khalsa got themselves back in the winning groove weathering a difficult storm to eventually beat neighbours AFC Wulfrunians. Unlike last year’s Boxing Day borefest between the two sides, this was a much livelier affair. Truth be told, after 25 minutes the visitors should have been five goals up rather than just the one. That goal, a rocket from range by Jumaane Meggoe, came on nine minutes and was accompanied by undoubtedly the most exotic goal celebration ever seen at the Aspray Arena, a twisting somersault that wouldn’t be out of place in the Moscow State Circus. Wulfrunians would already have been ahead had Sam Arnold not pulled off a good save to deny ex-Khalsa striker Kyle Brady two minutes earlier. On 14 minutes came the controversial decision of the half, Brady’s goal chalked off for a foul on the keeper, a decision perhaps best described as ‘soft’. On 22 minutes, Jake Webb turned Carlo Franco and forced Arnold into another good save and less than a minute later Ben Jevons curled an effort from just outside the area inches over the bar. When Webb spurned a golden opportunity from eight yards out from a Brady cross, Wulfrunians really should have been out of sight. Three minutes later, at the other end Dan Westwood struck the post after cutting inside, giving Khalsa a bit of belief after being under the cosh for so long. And on 31 minutes, Liam Armstrong lashed home an equaliser from the angle, his first league goal for the club, to give Khalsa undeserved parity on the balance of play. Khalsa came out a different team in the second half and began to gasp the nettle, seizing the momentum and putting the visitors under serious pressure. 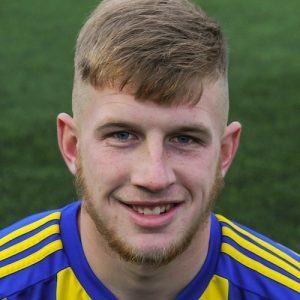 On 57 minutes, the breakthrough came when Josh Thomas put Khalsa ahead with his first league goal of the season as a freekick into the box was dealt with by Wulfrunians about as badly as it is possible to do so. Two minutes later and it was 3-1, a piece of Christmas magic from Westwood who turned and twisted in the box, firing a looping effort into the far corner for his 23rdof the season. It was almost game over just seconds later when Sean Williams, making his return to Khalsa after three seasons away, smashed a long-range swerving effort off the crossbar. A bit of a dampener was put on proceedings on 69 minutes when Khalsa skipper Tes Robinson received a straight red for denying a goal scoring opportunity as Meggoe surged through. But despite the numerical disadvantage, Khalsa increased their lead on 83 minutes, substitute Mensah Kinch doing brilliantly to stop a ball going for a corner, Wulfrunians keeper Jake James spilling the ball and Jay Holdcroft tucking home. Certainly, the scoreline flattered Khalsa. But after bad runs of luck in recent weeks, it is a welcome three points ahead of Saturday’s clash with Quorn. Sporting Khalsa: Sam Arnold, Carlo Franco, Adam Osbourne, Leon Miles, Tes Robinson (captain), Alex Woodhouse (Alex Perry), Josh Thomas (Mensah Kinch), Liam Armstrong, Dan Westwood (Jay Holdcroft), Dave Meese, Sean Williams. Subs not used: Garfield Robinson, Nick Turton.